The last few days I have found black, rubbery, leafy stuff (yes, that is the technical name I’ll give it) on the washing. Turns out one should run a ‘normal’ full cycle with a cup of vinegar or 2 caps full of Eucalyptus oil once a month to clean out your washing machine. I guess it is like using the dishwasher cleaner once a month. I never thought about regularly cleaning the washing machine. I’m a regular user of eucalyptus oil, I usually buy the Bosisto’s eucalyptus oil spray and the oil in the bottle, so I decided to go with the oil option and low and behold, no more rubber leafy thingys. I swear eucalyptus is essential in my house! I use the spray on my son’s chef uniform (hello, stain central!) and the boys clothing for stains, as you would with Preen etc but the eucalyptus spray actually works better. If I just wash his uniform with Omo, when I get them out of the dryer the clothing smell like off milk (especially his aprons), so also adding a cap full of Eucalyptus oil is essential. It is also brilliant with chocolate stains, even chocolate Paddle Pop stains (any Mum know how much of a pain chocolate ice cream stains are to get out). Pen stains, paint stains on school uniforms, white board marker stains…. you name it I have used Bosisto’s Eucalyptus oil to remove it. I’ve even removed roofing silicon off the car with it (ahh yes, thank you middle child for that! He was ‘helping’ Dad and wiped his hands on my car. As you do). It’s also great for smelly bins and the boys toilet (we won’t even go there!). The boys had head lice a few times this year and as you have to wash EVERYTHING, I added a cap full of Eucalyptus oil to the wash of bedding, soft toys, cushions etc. Also, if your children have allergies, asthma, excema etc add a cap full of eucalyptus oil to the bedding washing. It will kill any dust mite lurking in it. Another tip, if you have ant problems, add a cap full of Bosito’s eucalyptus oil to a bucket of water and wash your floors with it or wipe down your benches with it, it deters the ants. They don’t like it. How fun would it be? And the floors would get done in no time! Anyhooo…. Last week I was contacted by Bosisto’s to review their new lavender oil range and yes, I was thinking “Umm what could I possibly use lavender for?”. I was amazed there are so many uses for it. I found it quite interesting to learn Lavender oil is renowned for its calming and sleep inducing properties, helping reduce mild anxiety, improve sleep quality and promote relaxation. You know how it is… it might happen as your head hits the pillow; your brain wound tighter than a fishing line, reeling in thoughts by the dozen. Or it may happen at 4am, when the next day’s worries start pouring in. Night after night after night… and the more you think about sleep the harder it becomes to achieve. If you think missing out on a good nights sleep is not serious, think again. Studies show constant poor sleep can have a knock-on effect that goes well beyond tiredness, leading to lowered immunity and mood, poor concentration, increased likelihood of accidents and weight gain. But what can be done if you’re not interested in pills and chemical remedies? Take a tip from mother nature… with Bosisto’s Lavender Oil and Spray – the perfect antidote to help calm the nerves, relieve stress and help send you off into a blissful nights sleep. And now you don’t even have to get out the oil burner. 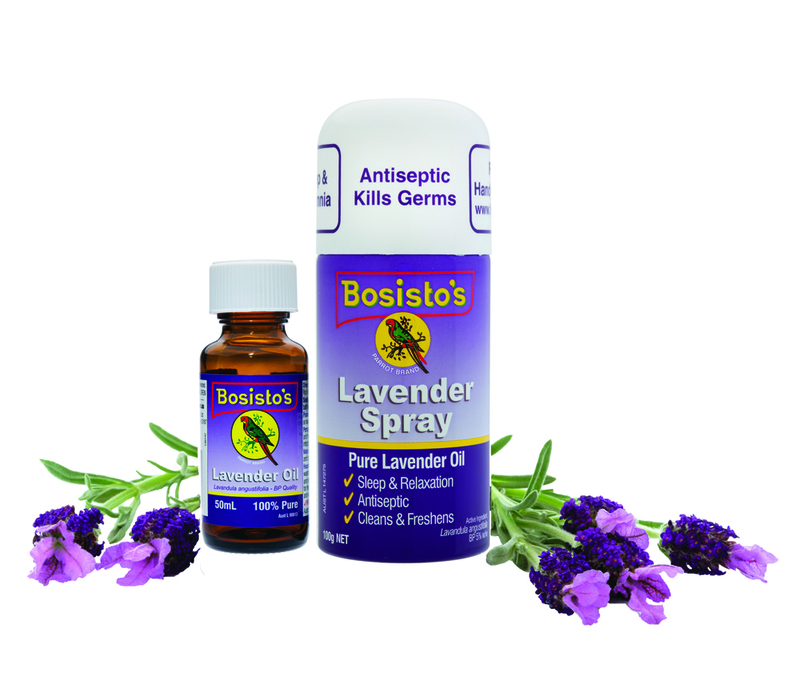 Bosisto’s has made aromatherapy quick and easy, harnessing lavender’s soothing properties in a handy spray. Spray Bosisto’s Lavender around the bedroom, on pillows or sheets before bedtime, and enjoy a beautifully fragrant way to drift off to sleep. It’s even gentle enough to use in baby’s nursery; both for relaxation and as a natural room deodoriser, with no harsh chemicals to irritate little noses. Head throbbing during the day? Spray or dab Bosisto’s Lavender onto a handkerchief and inhale. It will help reduce stress levels instantly, as well as helping manage tension headaches. Why not start a ‘lavender routine’ at night? After a hard day, slide into a warm bath with a few drops of Bosisto’s Lavender Oil (or into a foot bath if you’re too tired!) and slip between your lavender-scented sheets for a truly blissful start to the night ahead. Previous Post Supergirl Clothing. Win a clothing pack..